Introvale: 3rd Big Birth Control Pill Recall In A Year : Shots - Health News Sandoz, a unit of drug giant Novartis, is recalling 10 lots of Introvale birth control pills that may have pills in the wrong positions. It's the third big recall of birth control pills because of packaging problems in less than a year. Taking the wrong pills at the wrong time can lead to an unintended pregnancy. What's so hard about making sure the right birth control pills are in the right place inside their packages? Evidently, it's not as easy as you'd think it should be. 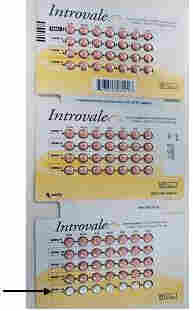 Sandoz, a unit of drug giant Novartis, is recalling 10 lots of Introvale birth control pills. It's the third big recall of birth control pills because of packaging problems in less than a year. Taking the wrong pills at the wrong time can lead to an unintended pregnancy. An unnamed consumer told the company that seven white sugar pills, or placebos, were in the ninth row ("Week 9") instead of the last row of the 13-row Introvale blister packs, where they should have been. The black arrow in the picture is pointing to the placebos in the right position. If you've got Introvale pills, check the card to make sure the dummy pills are in the right place. The 84 pills containing pregnancy-preventing hormones are peach-colored — not white. You can also check the lot numbers. The affected ones are: LF00478C, LF00479C, LF00551C, LF00552C, LF00687C, LF00688C, LF00763C, LF00764C, LF00765C and LF01261C. How many packages is that? I asked Sandoz but didn't get an answer. A representative said the company will release an "official recall letter in the near future" that will contain all the information the company is prepared to share. The affected pills were distributed between January 2011 and May 2012. "In the unlikely event that a patient finds a white placebo tablet in any position other than the 13th and final row (Week 13), they should immediately begin using a non-hormonal form of contraception," Sandoz said in its recall statement. In February, Pfizer recalled 1 million packages of birth control pills from 14 lots. Some packages had the pills in the wrong order. Others had the wrong number of different pill types in the packages. Last September, Qualitest Pharmaceuticals, an Alabama-based maker of generic drugs, mistakenly put some birth control pills in the wrong places inside plastic packages. Eight types of oral contraceptives were involved.